Crops - Lewis Farms Ltd. 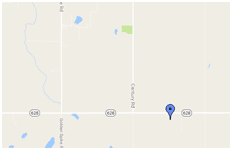 Here at Lewis Farms our cropping division is fundamentally based on a healthy rotation. The baseline for our rotation is always centered around soil health and planning for our potato crop. 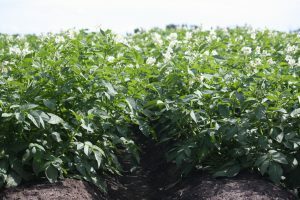 We are currently growing 400 acres of quality seed potatoes. Half of those acres being dedicated to Russet Burbank production and the other half for chipping varieties. Starting the rotation with seed potatoes. We are firm believers in always taking the high road when it comes to making decisions on anything we produce here at Lewis Farms. The potatoes are no exception to this policy. A heavy fungicide program, preventive insecticide applications, and seed piece treatments are all production tools we heavily rely on, amongst many others. The year following a potato crop, we are utilizing a canola crop. We believe that a worked, black seed bed is essential in getting a canola crop out of the ground. An added benefit to canola after spuds is its ability to utilize excess nitrogen left behind by the potatoes, without any lodging issues. 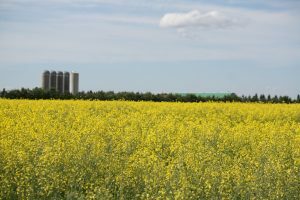 We feel proper chemical rotation is as important as rotating crop, so we like to grow one year of Invigor canola for every two years of roundup ready canola. 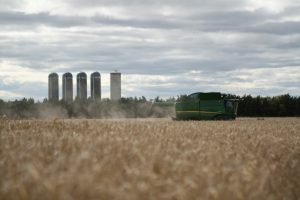 Wheat is used following the canola crop. We are currently growing hard red spring wheat. As we like the added straw volume compared to a cps wheat. Feed barley is grown the year after wheat. Again we are fully utilizing the barley straw and also feeding a portion of the barley crop. 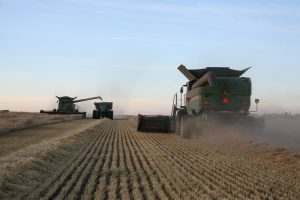 A second consecutive year of barley is grown prior to potatoes being planted. We combine the second-year barley as a high moisture product. This gives us the ability to get on the land early in the fall for any weed control and soil prep work that needs to be done. We believe that this practice makes for a great start for the upcoming potato crop. We are also cycling hay and corn crops in throughout this rotation. The corn is grown for silage purposes. Ideally we like to grow the corn on land that cattle can have access to. By grazing the chopped corn stubble we can really minimize losses from the chopping process. However we are never growing consecutive corn crops on the same land. Our hay crops consist of a grass/ alfalfa mixture. Not only does the hay provide us with invaluable feed. It is also as far as we are concerned one of the most proactive practices in maintaining and improving soil health. Depending on conditions we like to keep a field in hay production for 3 to 5 years before working up the sod. part of our customers success.